Thank you to everyone who came along and gave their time to help make Sheffield Hen Harrier Day 2018 happen. 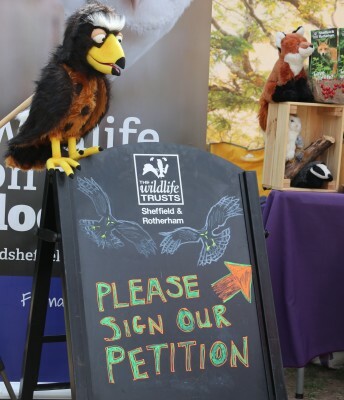 On Saturday 4th August 2018 we brought some of the biggest names in conservation together in the centre of the UK's Greenest City once again to call on the Government to give Hen Harriers and other birds of prey better legal protection. The weekend before 'the Glorious' or 'Inglorious' 12th August,' that marks the start of the Grouse Shooting season. An event which is commonly associated with the especially in our upland areas around grouse moors and hunting estates. It is believed that this is due to a minority of gamekeepers who see these birds of prey as a threat to the viability of their shooting estates and way of life through hunting the species that they target in their hunting and shooting activities. While it is true that Hen Harriers will take a small number of grouse chicks, their staple diet consists of voles and their breeding success rates are a direct link to that of the small rodents. Liz Ballard, Chief Executive of Sheffield and Rotherham Wildlife lead the lineup of speakers infront of hundreds of people in Sheffield City Centre. Each speaker called for the same thing, that we need our Hen Harrier population to bounce back, but with a slightly different way of going about it. Some want driven grouse shooting to be banned, while others push for shooting estates to be licensed. We all have one thing in common, the chance enjoy the sights and the sounds of the skydancer and other birds of prey in the sky across the UK. 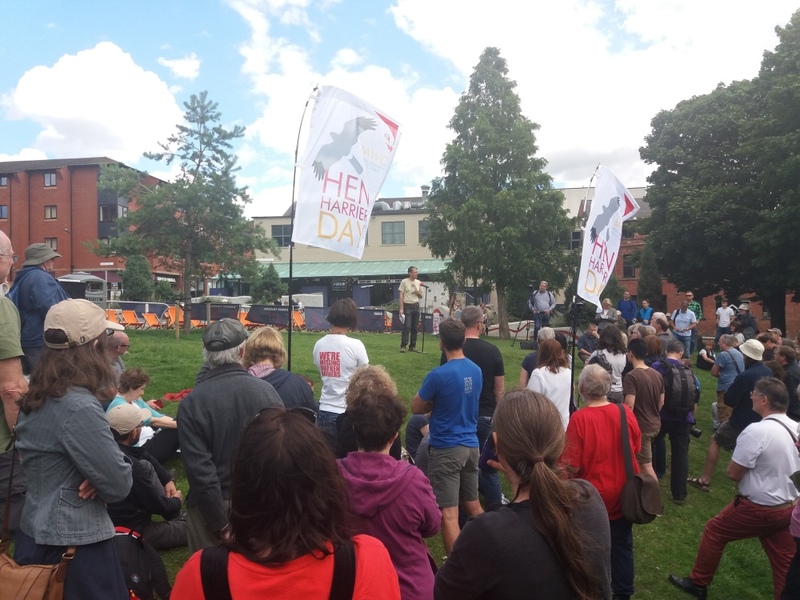 Last year we took the opportunity to bring Hen Harrier Day out of the countryside and into a City Centre for the first time. There were a few reasons for this, but the one thing that made the move most worthwhile was the media attention it's brought. If you make a noise in the countryside someone may hear you. However if you make a noise in a busy city centre, someone will hear you and the more people hear you, the more likely they are to take notice. Thankfully it paid off again this year as we were joined once again by the broadcast media, this time by Sheffield Live. If you weren't able to make it to our Hen Harrier Day, here is their take on the big day. the English adult population should be. adulthood without the added threat of persecution. nests in England" RSPB Hen Harrier Life+ Project. You can learn more about these iconic birds on the RSPB's Hen Harrier Bird Facts page. Photo; Guy Shorrock, RSPB Birders. Have you met Our Calluna? A specially comissioned mascot character based on the juvenille bird who was sat tagged on the National Trust for Scotland's Mar Lodge Estate in the Cairngorms National Park last year. Unfortunately the original bird went missing a few miles to the east of her birth place over a grouse moor to the north of Ballater. Take a look at her webpage for more information. Here she is at Old Moor, one of the RSPB's Dearne Valley Reserves in South Yorkshire. Join the organisations who are working to make a difference. Conservation organisations can't work without the help of people like us, by joining them you are giving them the means to carry out the good work that they do. From studying the wildlife and how best to manage their habitats to campaigning, lobbying Government and looking after their habitats it all happens thanks to their members. By joining you aren't just giving them money, you are boosting their membership numbers, giving them a larger voice which makes them heard by more people. 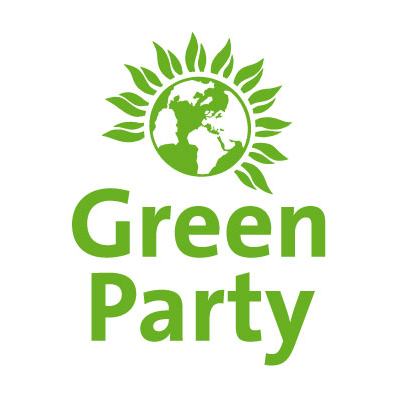 Sheffield Environmental is committed to remaining party politically neutral, Green and Labour Party MPs were invited to speak on the day. unfortunately Labour weren't able to put anyone forward, which is why the Greens have a large presence over other parties on this page. 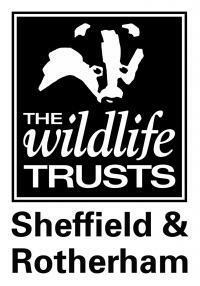 Keep your eye out at future events for Sheffield and Rotherham Wildlife Trust's petition to ban stink pits at future events in and around our City and Townships. 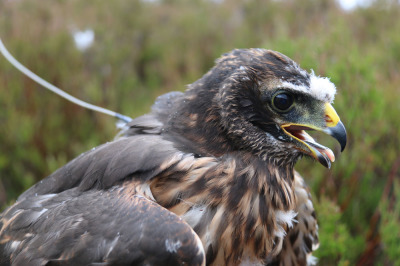 Take the time to look at their "Our Moors" campaign which aims to reverse the effects of intensive grouse moor management and stop the persecution of birds of prey. The RSPB have been managing parts our uplands, creating habitat for Hen Harriers for a number of years through buying and managing reserves, as well as working in partnership with other organisations. 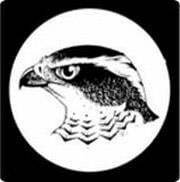 They have been investigating any suspicious situations relating to birds of prey through their Investigations team and Skydancer campaigns. These are just a small number of campaigns run across the country that all need our help. 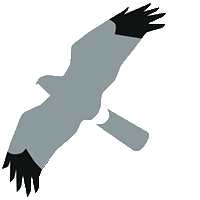 We are working to increase awareness of Birders Against Wildlife Crime's ' Three Rs' ('Recognise, Record, Report') campaign which aims to guide you through the steps to take should you witness illegal activity in the countryside. 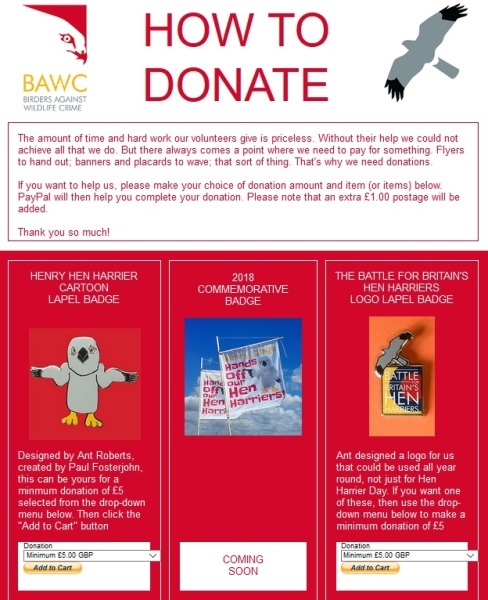 If you would like I further support BAWC and keep up to date on future Hen Harrier Days and their Eyes in the Field conferences, the easiest way is to follow their Facebook and Twitter Feeds. You can also follow us on Facebook and Twitter for environmental news stories and events in the Sheffield City Region. 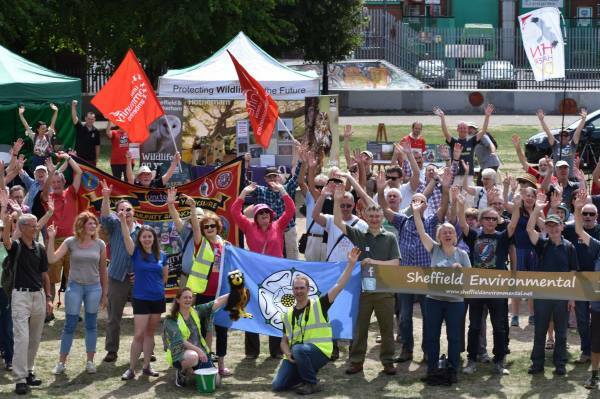 Everyone who helped make Sheffield Hen Harrier Day happen gave their time voluntarily. 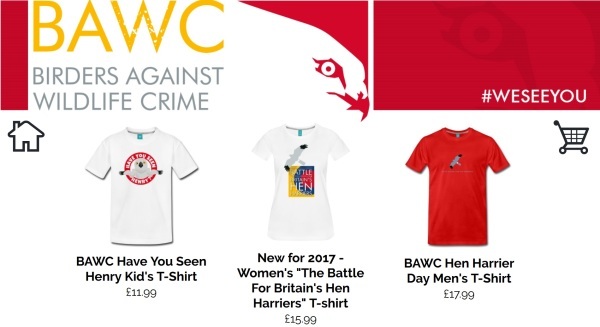 To make their effort worthwhile please donate to Birders Against Wildlife Crime, or buy something from their online shop to help them fight wildlife crime. Every penny you donate makes a difference, so please give what you can. 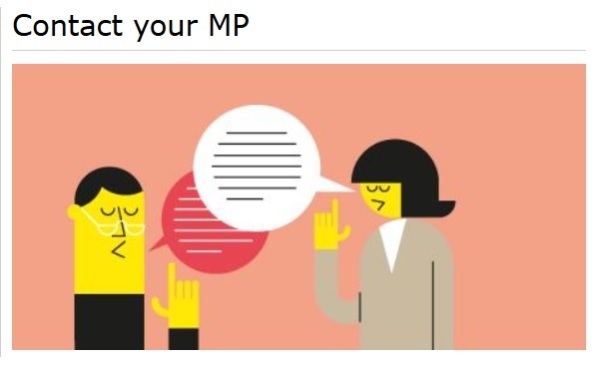 We elect MPs to be our voice in Parliament, it is their job to stand up and speak for us in Westminster. They can only do this if you contact them, by emailing, writing letters or visiting them at one of their surgeries. 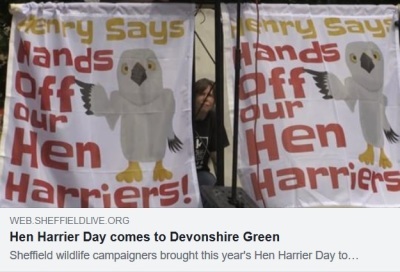 If you feel strongly enough to come along to a Hen Harrier Day and can't make it, or even if you can why not drop them a message of some kind. Things can only change if we exercise our democratic right. Three Sheffield MPs and councillors were invited to speak at the event, but none of them could make it. So when you send them a message please quote the campaigns above to make sure they know how much this matters to us. It's nice to share photos, if you took any or got any video footage from the day feel free to share them with us over at the Facebook Event page. It will be great to see them!